As I recently blogged, I picked up an iPad, and have been using it (mainly) as an ebook reader. I prefer using the Kindle app on the iPad to read ebooks, and the Amazon Kindle book store seems to have the best price/range as well. 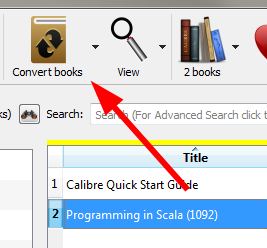 But I recently had a situation where I had bought a digital copy of Programming in Scala: A Comprehensive Step-by-step Guide which only comes in PDF and ".mobi" versions. .mobi is the format used by the Kindle, so I thought "woo hoo" this should be easy, right? It's not possible to get .mobi books into the Kindle app that weren't purchased from Amazon right now. I did some googling and found a number of forum posts recommending iPad/iPhone file system tools to drop the ebook into the Kindle folder. Unfortunately on Windows I wasn't able to get these to show the Kindle app's folder. So I tried looking for another solution, and although the iBooks app isn't as good as the Kindle app for reading, I figured converting the .mobi book to an .epub book for iBooks would be an easier task. The same process can also be used to convert books from/to other ebook formats. Install it, I'll assume that you're installing on Windows and with the default settings. Start the program when installation is complete. When you're prompted as below, choose "Apple" as your default reader. 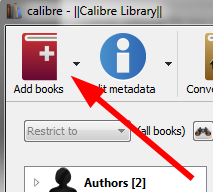 Once it's loaded, use the "Add button to add the .mobi (or other format) book to Calibre. It should then show up in the list of books. Click the "Convert" button. When the conversion options dialog appears, use the default settings and click OK.
You should see a "Job" appear in the Jobs monitor in the bottom right hand corner of the screen. Wait for the book to be converted and the Job count to return to zero. Right click the book and choose the "Save to disk -> Save only EPUB format to disk" option and choose where to save the resulting ebook. The ".epub" book can now be dragged from the file system to iTunes and synced on the iPad. 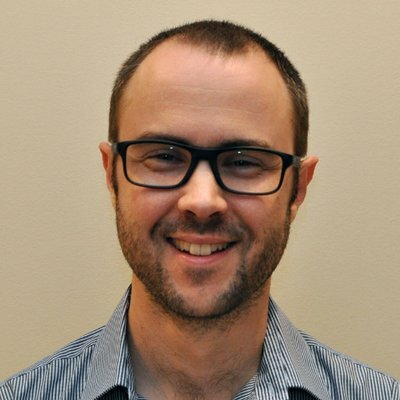 Calibre seems to be another great open source tool that I've never heard of. It's a shame the ebook distributors such as Apple and Amazon can't settle on a single format, and/or provide better interoperability between their formats/devices, but I guess vendor lock-in is still the modus operandi for the time being. Recently got into e-books and it was a lifesaver to find this post, thank you Richard. Great post. I found this very useful. I have also found the rest of your blog very interesting. Definitely helpful. Recently switched from a WinMo phone, using MobiPocket software, to an Android software. No ebook reader software for Android actually supports the .mobi format, so I was going nuts trying to find ways to convert all my books to use them on the new phone. From what I can tell most companies are using the standard epub format. The only one that isn't is Amazon who uses mobi. The issue is that they probably have more ereaders and books than any of the other manufactures (Sony, BN, Kobo, etc). If you are looking for interoperability then I would stay away from amazon. Thanks for the post Richard. I had a .mobi file that wouldn't read on my Android device with Kobo Reader. This worked perfectly !! Appreciate it ! Thanks for this post - was a life saver! Awesome! Just what I was looking for, Thanks. Guys I am new to this ebook thing and just planning to buy my first one and considering the price and other issues I think of buying Kindle but most of the ebooks i have are in epub and pdf formats which are not properly read in Kindle,,So can anyone suggest me if i can convert pdf and epub files into mobi for kindle and how good is the quality of the converted file,? Asim: Calibre is able to convert epubs into mobi without problems. PDF's is another matter. Most PDF files have codes in them that are not easily transferred in other formats, and you often end up with an unreadable file if you try to convert it. PDF is just not a good format for books unless you use the acrobat reader to open it. I am currently having a Nook but plan on purchasing a kindle fire. As I do not want to lose out on all my books that I have currently, I made sure that calibre will deliver a good result for me when I convert the epubs to mobi. I have recently joined the Apple fraternity and your blog is saving me my hair. I have collection of mobi format ebooks that I can now enjoy on my 4S. THANK YOU!!!! Works like a charm! This was perfect and the step by step worked flawlessly. Needed these instructions to help out a friend with converting his mobi which he couldn't open on a work computer. Worked perfectly....thank you for your step-by-step! I have recently purchased an ipad2, lucky to find this post. This will definitely help lot of people. Hi all, an easy way to get a mobi book into an iDevice, is to set up the mail service on the iDevice, open your PC email program then compose a mail, attach the mobi file and email it to yourself. On the iDevice open your mail, select the book attachment and the iDevice will ask f you want to open in Kndle, select yes. All very easy. This is the real deal - the first program I've come across that converts ".mobi" to ".epub". Thanks for sharing the info! was really a big help!!! I just used Lee's method, and it works like a charm. Thanks!! 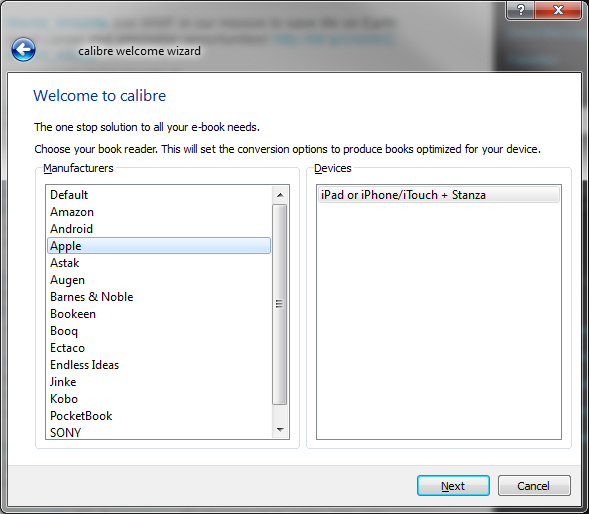 Calibre is a pretty impressive solution for e-book management. Its vast number of features, the fact that it can convert between a lot of e-book formats and that you can edit any e-book you want are pretty impressive. Even more impressive is that Calibre gives you all of this for free, without charging you one cent. Thank you VERY much for recommending Calibre! Works exactly as you said it would, honestly this is probably the first program I have ever downloaded that worked so effortlessly! HUGE THANK YOUS! Thank you sooo much for sharing your resolution Richard! I have been an avid reader for several decades and only recently starting going the digital route. It has been frustrating finding all the books in a series at reasonable prices if at all in epub format. You rock! Please remember.!!! most of the ePubs (iPad) PRC (Amazon) are not up to the mark or not professionally designed. Make sure the epubs &amp; prc files has cover image, toc, ncx, etc. If you need any help regarding this matter feel free to contact me..!!! Thanks! Worked like a charm! The Calibre program was easy to use especially after you spelled it out for us! Thanks for this! Coincidentally, I needed to use the info for the *exact* same book (Programming in Scala, ;)), but I wanted to read the Kindle version using iBooks on the iPad. I like Calibre, thanks for your article. Dude, for a random article I just came across, this was super helpful. You've made my interactions with my Nook infinitely easier (and placated my OCD in the process).